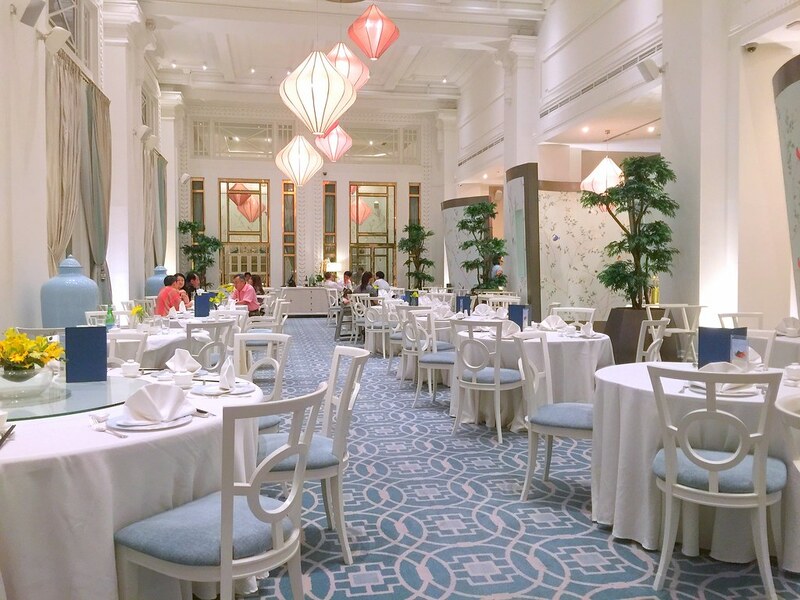 Jade Restaurant at Fullerton Hotel Singapore has just undergone a revamp. Imbued with elegance, garden-inspired wallpaper now adorns the partitioned areas with hues of Spring. With this new light and warm interiors, yes, Spring it is with Jade's new experience - Gourmet Dim Sum Treasures, available on weekends and public holidays. Reflecting the native birds residing on the wallpapers, master Chef Leong Chee Yeng and his award-winning team named their new dim sum set menus Purple Finch, Paradise Flycatcher and Royal Peacock respectively. 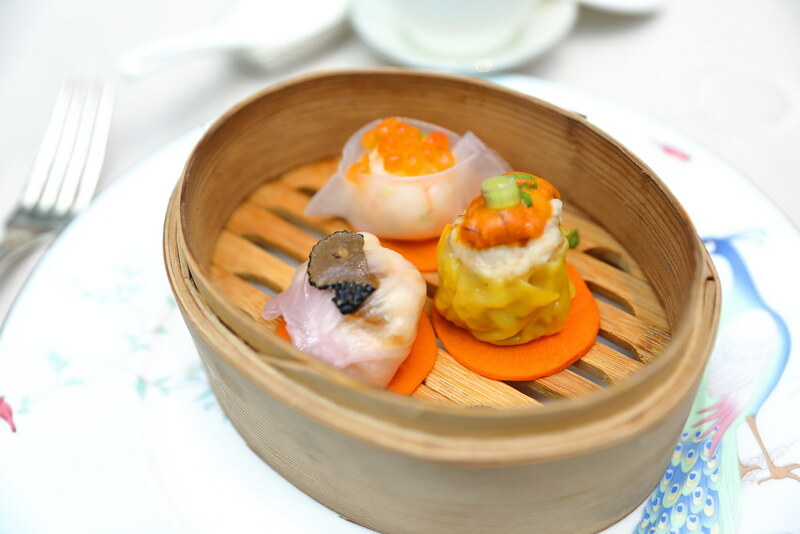 We started off with a trio of contemporary bites from Royal Peacock ($108* per pax) - Scallop Dumpling topped with Salmon Roe, Golden Sea Urchin Siew Mai, and Foie Gras Truffle Shrimp Dumpling. 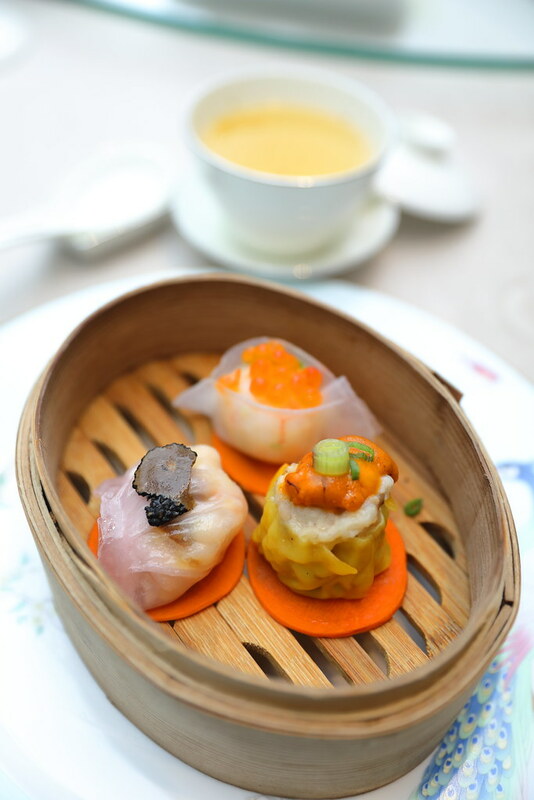 Crowned with luscious ingredients, each dainty piece of dim sum is packed with extravagance in both taste and texture. Served in an individual basket, I love the fact that I get to have a private moment with all the 3 assorted dim sum instead of having to pick from the common basket. 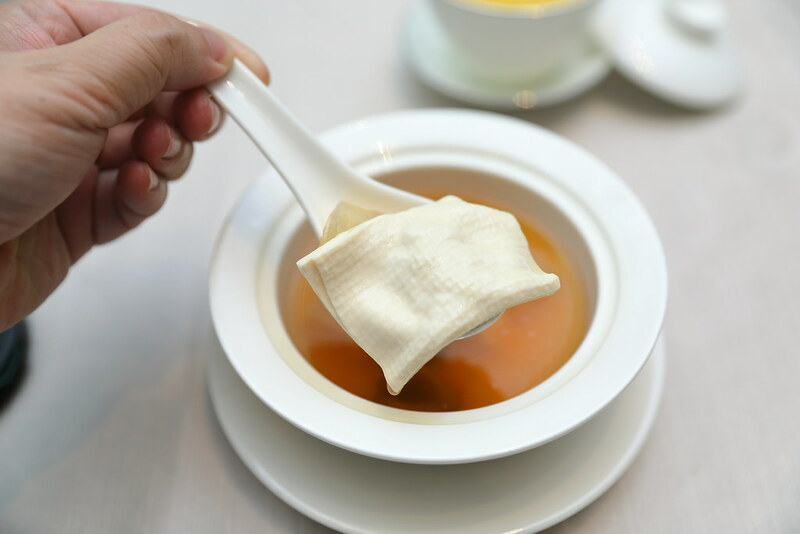 One of the most prided dishes in Cantonese cuisine is of course the double boiled soup - Double Boiled Fish Maw from Paradise Flycatcher menu ($88* per person). Despite it's clear base, I could instantly taste the collagen rich consistency in one sip. The roasts here are highly recommended. None of the set includes that, so you got to order from the Master Chef’s Specialty section. 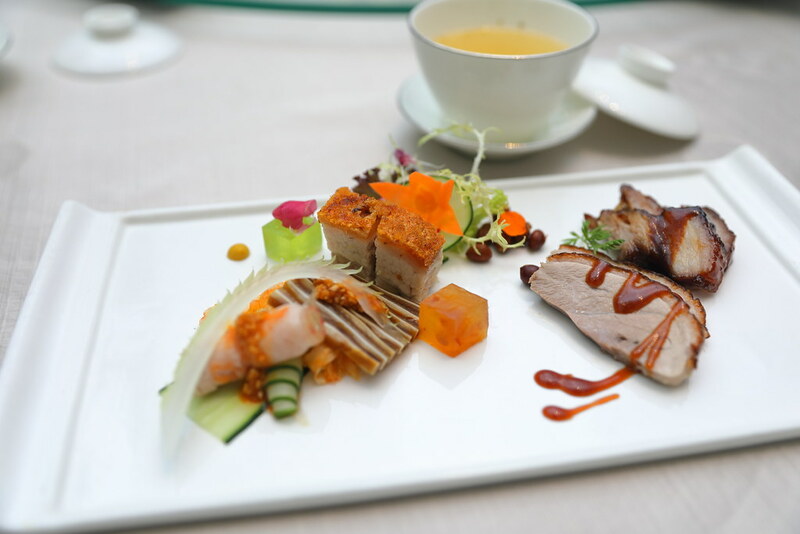 Our Garden of Roasted Delight is made of Honey-glazed BBQ Pork, Roasted Duck, Thousand Layer of Pig's Ear, Thinly Sliced Pork and Crispy Roasted Pork Belly. The cold and crunchy pig's ear, which reminds me of Sichuan's pig's ear salad, adds an interesting character to this garden of roast meats. Start off with this appetising crunch before you proceed with the rest. The char siew has fats that melts away readily to flavour its caramelised sweet sauce encasing the meat, and the Crispy Pork Belly provides the same satisfaction with its incredibly crispy skin atop its tender meat which is almost wobblingly tender. To cap the meal, we had Wok-fried Rice Flour Rolls with Scallop in X.O. Sauce from the Purple Finch menu ($68* per person). The star of the dish is not the scallop but the umami-laden X.O sauce here that makes any plain carbs a treat on its own. 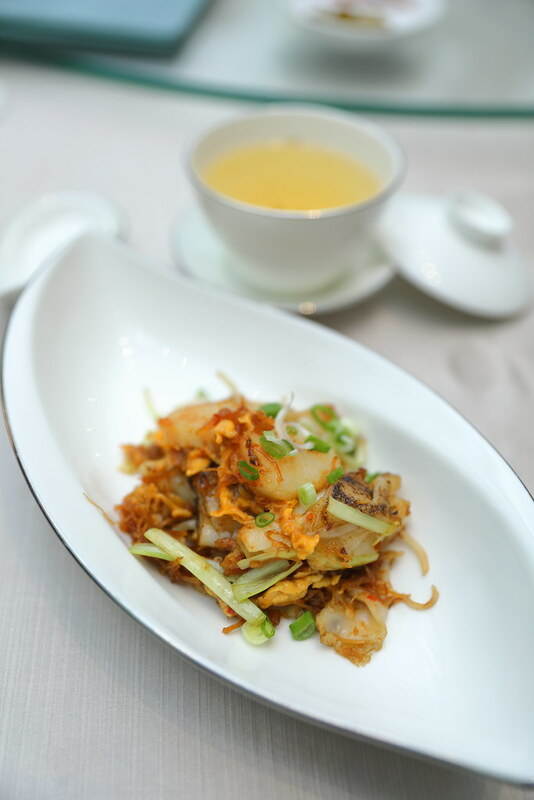 The essence of dried scallops and prawns, spiced up with chilli, garlic and onion, brings life to the otherwise plain rice flour rolls as it imprints a layer of wok-hei on its surface. 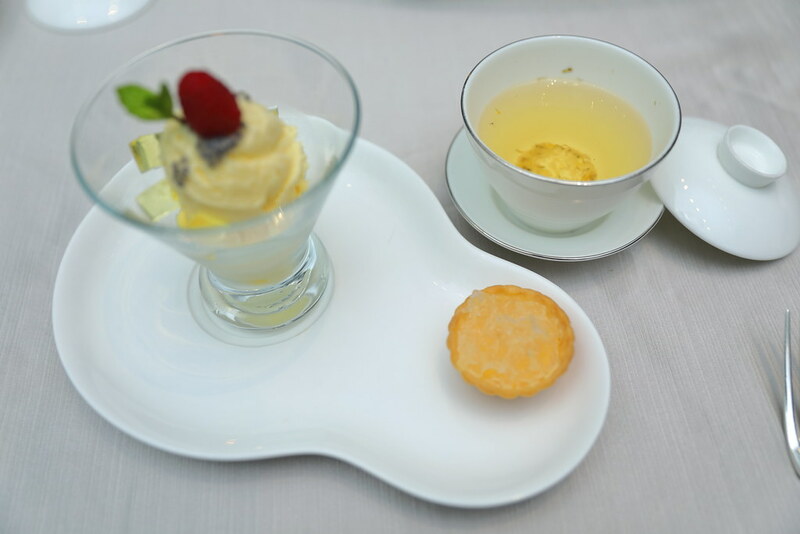 Wrapping up is a summery dessert - Shaved Pineapple Coconut Ice with Champagne Jelly, that comes together with a Bird’s Nest Egg Tart. The icy dessert is indeed a refreshing respite from the meal. Served warm, the egg tart perfumed my fingers with its buttery crust which is so fine that I could barely hold it without crushing it. Although the new menu is a lot more refine, I feel the spirit of chit chatting with loved ones over sharing baskets of dim sum is lost. That said, single portion serving allows much more intimate dining, especially for table of two. 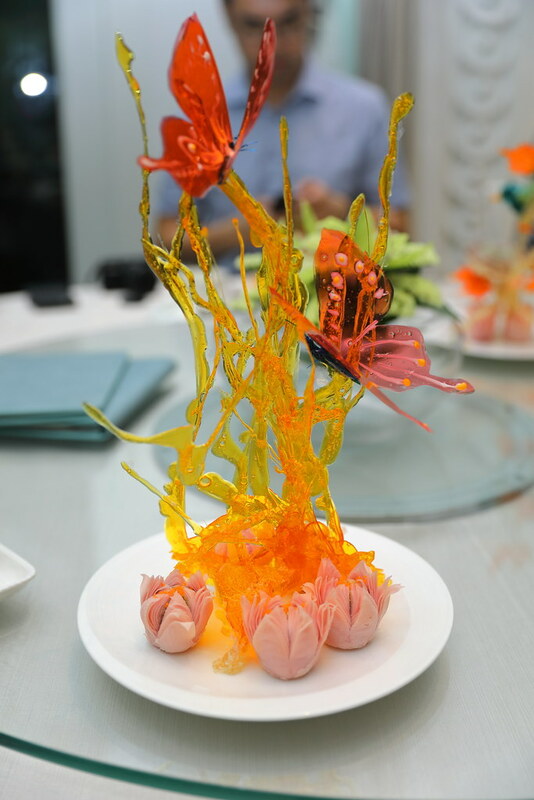 Moreover, you get to enjoy the luxurious dim sum in an unhurried manner as there is only one seating implemented from 12.00 p.m. to 3.00 p.m.
*All set menus require a minimum of two persons to dine. Prices are subject to service charge and prevailing government taxes.